'Open Daily 11:00am to 5:00pm, an Artist Daily' to meet and greet you ~ our community & guests. CVAA is the ‘ART and the ARTISTS. 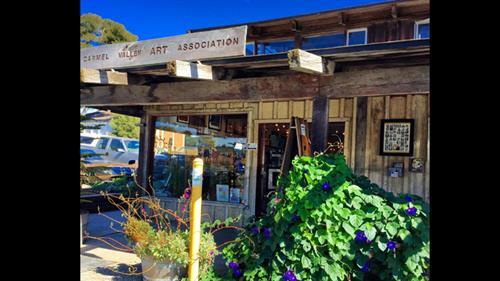 In the 10 years since founding Carmel Valley Art Association®cGallery, CVAA has grown to promote more than 50 talented local artisans. 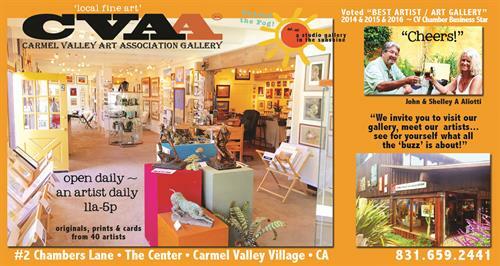 The business community voted CVAA the Carmel Valley Chamber's Star Business Award for ''Best Artist / Gallery of the Year 2016'' (2008, 2014, and 2015!) In April 2015 CVAA was also honored to receive the ''CREATIVE/TECHNOLOGY ECONOMIC VITALITY AWARD presented by the Monterey County Business Council for significant contributions to the prosperity of Monterey County. Co-owners John & Shelley Aliotti have created a successful model ~ a juried Art Association. 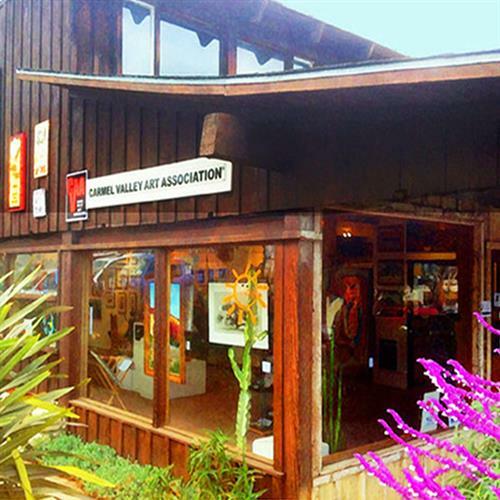 CVAA showcases local Fine Art: Paintings in Oil, Watercolor & Acrylics, Mixed Media to Three Dimensional and Sculpture, Mosaic & Glass, Photography and Jewelry designers including John Aliotti's popular Estate Jewelry. 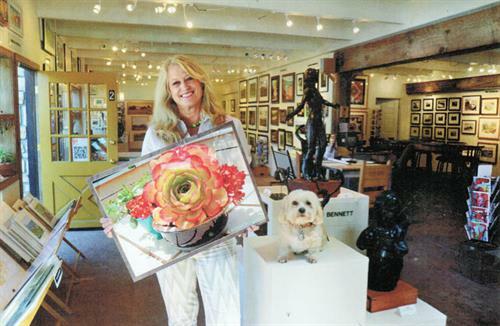 We have largest collection of original Cards, Prints and Posters in Carmel Valley. 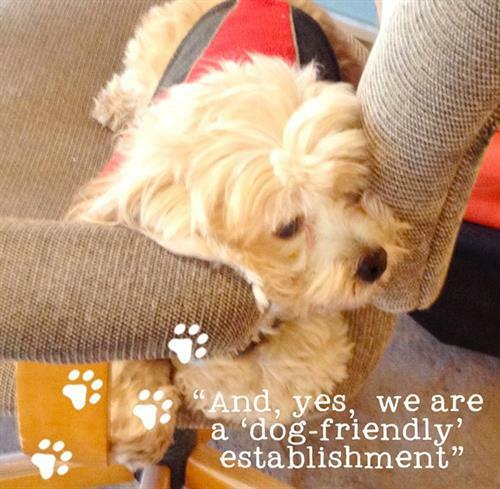 CVAA strives to make visitors comfortable reflecting the spirit of C.V. Village ~ friendly, yet savvy. ''This is the friendliest gallery around,'' says Featured Artist, famed Will Bullas. ''It's a co-op but actually more like a club,'' We're proud that our artists are local and work in the gallery once a month: 'Open Daily 11:00am to 5:00pm, an Artist Daily' to meet and greet you ~ our community & guests. CVAA produces the C.V. Village Walking Map & Guide (20,000 yearly) available at local businesses. Their 9th annual C.V. 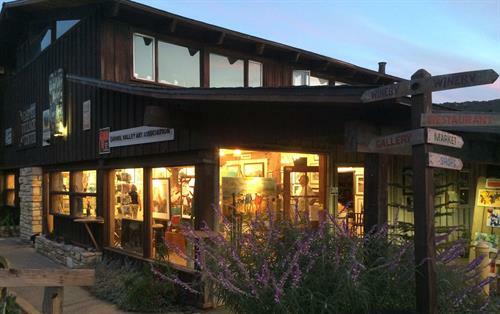 Village Holiday Art & WineWalk, November 26, after Thanksgiving, welcomes guests and starts off the holiday shopping season. Enjoy the beauty of the Monterey Peninsula!